Cetaphil Coupon is a mailable coupon. It’s hidden in one of the WebSaver.ca’s portals which you can find here. Select the cetaphil coupon, create an account with Websaver.ca and request your coupons to be mailed to your mailing address. You will receive your coupons within 1-2 weeks. All coupons are free and are mailed for free. 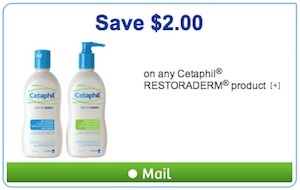 This is a Cetaphil coupon to Save $2 on any Cetaphil Restoraderm product. Cetaphil coupon is valid only in Canada. 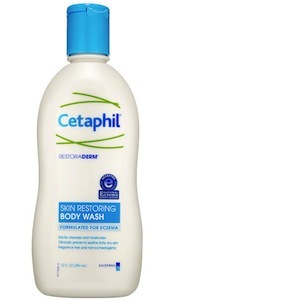 You can find Cetaphil Restoraderm products in any drugstore, Shoppers Drugmart, Rexall and more. Cetaphil® RESTORADERM® Skin Restoring Moisturizer is suited for anyone three months of age and older with dry, itchy skin symptoms commonly associated with eczema or atopic-dermatitis. Best used after cleansing withRESTORADERM® Skin Restoring Body Wash, this effective moisturizer withpatented Filaggrin technology™ and ceramide technology is formulated to hydrate and soothe very dry, atopic skin. Developed to help replenish and protect the skin’s natural moisture barrier, this nourishing skin moisturizer offers gentle yet effective hydration for dry, itchy skin. Free of fragrances, parabens and nut oils, Cetaphil®RESTORADERM® Skin Restoring Moisturizer is easily absorbed and restores moisture to help repair the skin’s barrier. Use as part of a dermatologist-recommended, daily skin care routine for the management of eczema.